The standard phrasal overlap portmanteau combines AX with XB to yield AXB; the material X is shared in the middle, as in sweet tooth fairy. But portmanteaus come in many forms, including those with shared material at an edge, as here: XA and XB combine to yield XAB. 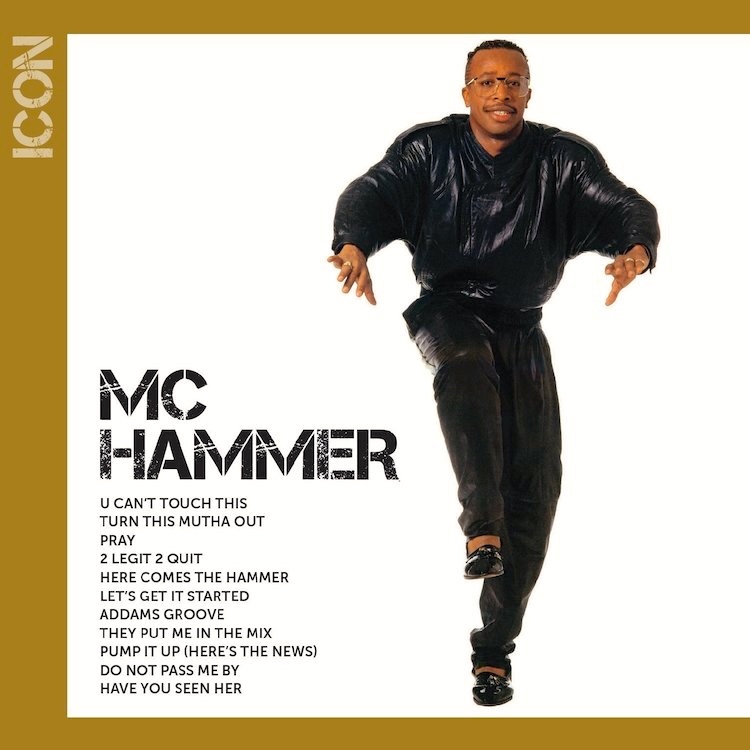 Of course, much of the charm of POPs comes from preposterous and unlikely combinations of contributing elements — in this case, the classic (some now say “old-style”) rapper MC Hammer and the geeky Dutch artist M.C. Escher. Stanley Kirk Burrell (born March 30, 1962), better known by his stage name MC Hammer (or simply Hammer), is an American hip hop recording artist, dancer, record producer and entrepreneur. He had his greatest commercial success and popularity from the late 1980s, until the early 1990s. Remembered for his rapid rise to fame, Hammer is known for hit records (such as “U Can’t Touch This” and “2 Legit 2 Quit”), flashy dance movements, choreography and eponymous Hammer pants. His work features mathematical objects and operations including impossible objects, explorations of infinity, reflection, symmetry, perspective, truncated and stellated polyhedra, hyperbolic geometry, and tessellations. 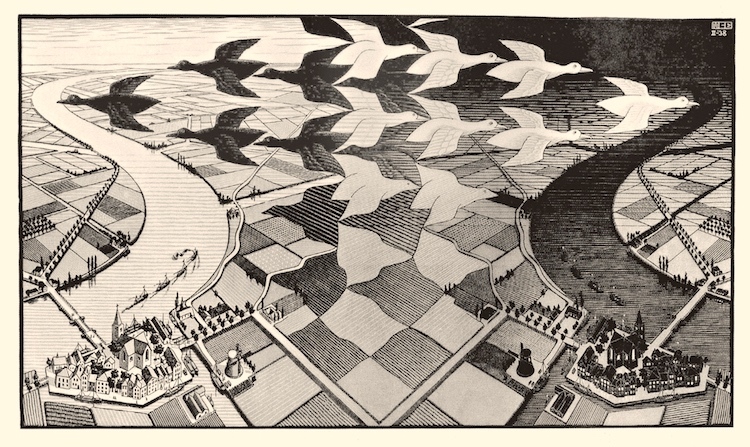 Although Escher believed he had no mathematical ability, he interacted with the mathematicians George Pólya, Roger Penrose, Harold Coxeter and crystallographer Friedrich Haag, and conducted his own research into tessellation. Early in his career, he drew inspiration from nature, making studies of insects, landscapes, and plants such as lichens, all of which he used as details in his artworks. He traveled in Italy and Spain, sketching buildings, townscapes, architecture and the tilings of the Alhambra and the Mezquita of Cordoba, and became steadily more interested in their mathematical structure. 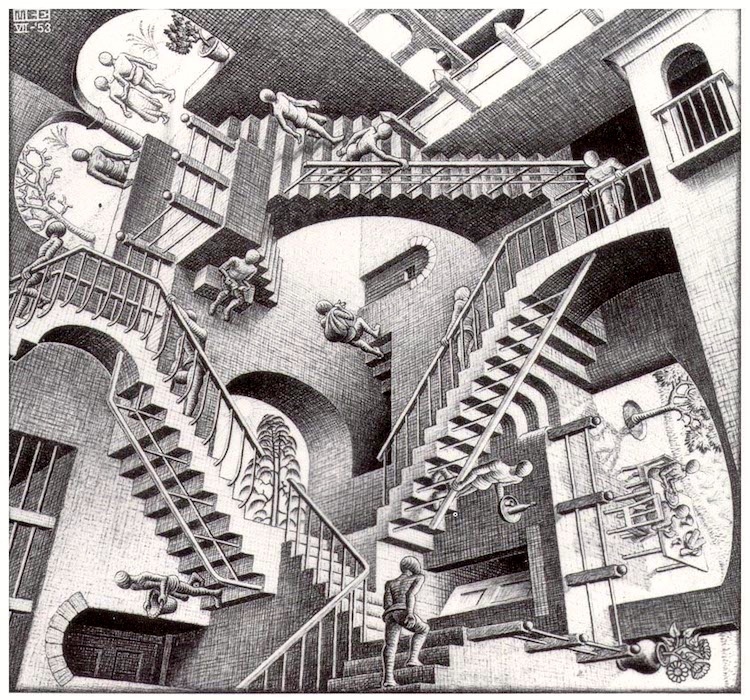 Escher’s art became well known among scientists and mathematicians, and in popular culture, especially after it was featured by Martin Gardner in his April 1966 Mathematical Games column in Scientific American. Apart from being used in a variety of technical papers, his work has appeared on the covers of many books and albums. He was one of the major inspirations of Douglas Hofstadter’s Pulitzer Prize-winning 1979 book Gödel, Escher, Bach. Despite wide popular interest, Escher was for long somewhat neglected in the art world; even in his native Netherlands, he was 70 before a retrospective exhibition was held. In the twenty-first century, he became more widely appreciated, with exhibitions across the world. Covered by numerous artists in various genres, “All Along the Watchtower” is strongly identified with the interpretation Jimi Hendrix recorded for Electric Ladylandwith the Jimi Hendrix Experience. You can listen to Dylan performing it here. This entry was posted on May 6, 2018 at 8:15 am and is filed under Art, Language play, Linguistics in the comics, Music, Phrasal overlap portmanteaus, Shirtlessness. You can follow any responses to this entry through the RSS 2.0 feed. You can leave a response, or trackback from your own site.